During pregnancy, many foods must be avoided or limited to protect the health of your growing baby. With the rise in alternative medicine comes the danger of using an herb that could harm your infant. 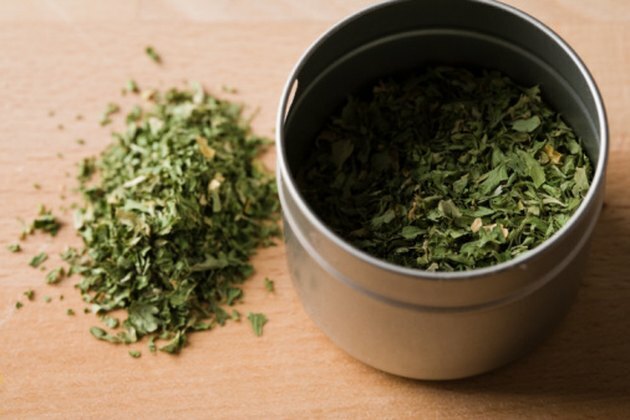 Oregano is an herb that is generally safe to use in small amounts, but always talk with your doctor before using it for any purpose other than to season your food. Dried oregano should be stored in a cool, dry cupboard, and fresh oregano keeps in the refrigerator for several days and in the freezer for months at a time. Avoid herbal teas unless your doctor tells you it is OK to drink them. Many herbs or herb combinations, including oregano, are uterine stimulants and could cause a miscarriage. This is because they are more concentrated in tea than they are in recipes, and larger doses pose a higher risk. Skip oregano oil in cooking. It is highly concentrated and produces the same risk as does large doses of oregano to make tea. Avoid using oregano oil for any type of aromatherapy during pregnancy as well. Season your food with dried oregano. It can be found year-round and makes a good addition to many dishes. Sprinkle some on pizza before adding the toppings or add a pinch to a batch of spaghetti sauce. Dried oregano is also a great ingredient when used to prepare pesto or to marinate mozzarella cheese for a salad. Make salad dressing with fresh or dried oregano. It creates a new taste for your vegetable salads and is simple to prepare. Blend chopped oregano with a small amount of oil, vinegar and garlic and mix well. Allow to stand before using so that the flavors can meld. Use fresh oregano in dishes for a new flavor. It pairs well with sauteed vegetables and meats when chopped and sprinkled in during the cooking process. Try adding it to bean side dishes or soups and stews. Diced oregano makes a good addition to a tossed vegetable salad or as a topping for scrambled eggs. Try Mexican oregano in your south-of-the-border dishes. It works well in meatloaf and barbecue sauce, as well as in refried beans. Try adding some fresh Mexican oregano leaves to your next batch of salsa or toss them into a taco or burrito for an authentic flavor. Look for marjoram. It is another name for oregano, so be sure you take the same precautions with it that you do with oregano while you are pregnant. Can You Eat Certain Foods to Decrease Breast Milk? What Are the Health Benefits of Tarragon? What Are the Functions of Dry Oregano? What Are the Benefits of Eating Whole Mint Leaves?